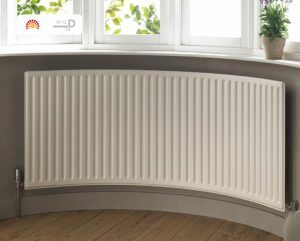 The latest Curved Radiators and Bay Window Radiators at the Best Prices! Over many years The Radiator Factory Ltd have become the retail market leaders and preferred trade supplier of Radiators for Bay Windows. This is sometimes also described as Radiator Curving, Radiator Bending, Angling and Shaping and basically means a radiator designed to better fit into a bay window area and keep it warm and comfortable. 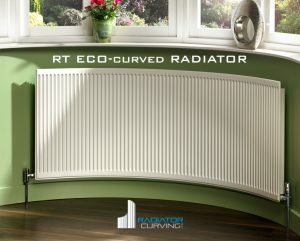 The RT Eco-Curve is our latest edition to our curved Radiator Portfolio. 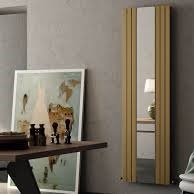 These slim line Radiators offer handsome looks & affordability, combined with modern HQO technology thus producing higher outputs with lower water content that can help in lowering fuel bills than any other compact radiator, size for size, in the market place. Finished in White Primer with a warranty of 10 years. 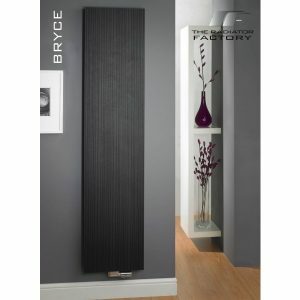 Available in 17 x popular Bay Window Radiator sizes. Lead time 7-14 Working Days. As well as offering a Curving Service for Radiators we also have vast experience in the manufacturing custom Angled Radiators to suit Angled Bay Windows. These types of bay windows typically consist of anywhere from two to six Angles making a traditional curved design less practical. 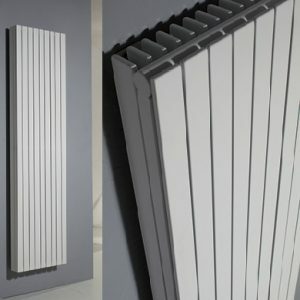 Like our in-house Curving Service we only offer this for Single Convectors units as modern technology has produced radiators with a significantly greater Heat Output. 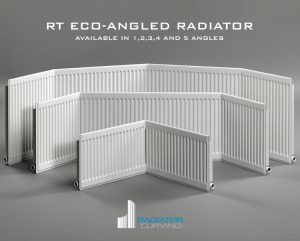 These Eco-Round Top Radiators are highly efficient and make an attractive addition to any angled bay window. We would require a Wallpaper Template of the existing Floor Area to work to, but please make a note to mark whether its taken to Skirting or Plaster line. Made in Britain, Angled in Leicestershire! For the more traditional look the Cru-curved is pure alcove alchemy. With lean, classic lines, this high output, column radiator is in harmony with any bay window, making heat visually neat. In a helpful variety of heights and widths, white or in a range of colour options to suit all colour pallets! The Cru-curved is guaranteed for 10 years and available with or without welded feet. 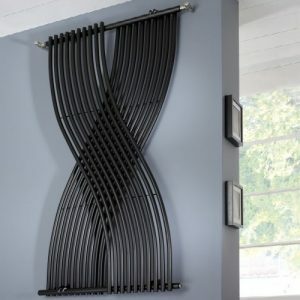 The Round Top Curve has been our favourite Curved Radiator for the past 20 Years or so. 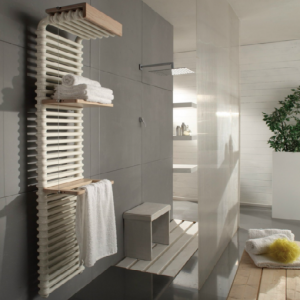 This trusted radiator was UK made in Lancashire by Quinn/Barlo, sadly due to a factory move to Newport, Wales, this model is no longer manufactured and has been superseded with the new Eco-Compact Radiator. We have bought the entire stock from Quinn & the good news is we still have some models left in Bay Window Radiator sizes at vastly reduced prices. Available in White Primer & 5 Year guarantee with a quick lead time of just 1-2 Weeks. Call 0116 260257 to discuss you requirement or order online! 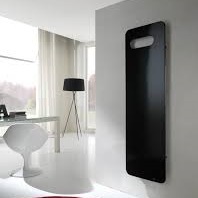 All of our Curved Radiators except the new CRU-Range are manufactured in house at our Leicestershire works. The current owner has over 28 years industry experience and a reputation for quality and price that is second to none.National Merchants such as PTS, Grahams, Plumb Centre, Travis Perkins/City Plumbing and Plumbase/Buildbase to name a few, all have accounts with us. 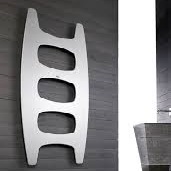 So if you prefer or if you are a Trade Customer you can discuss your requirements for a quality RadiatorCurving.com radiator with your nearest Branch Manager. Alternatively, why not visit us here in our Leicestershire Outlet where you are able to view these products in our comfortable showroom. 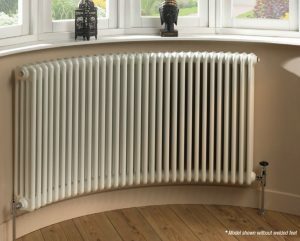 We can offer an unrivaled service based on quality and price of the finished radiator but also offer the fastest lead times for Bay Window Radiators, Curved Radiators and Angled Radiators to suit your needs. Please do not hesitate to call our Sales Team on 0116 2609257 for more information and a great price!